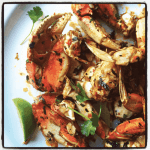 Southeast Asian flavors and just a little bit of heat make this oven-roasted Dungeness crab a delicious mess to be enjoyed with lots of napkins. History of Dungeness crab at San Francisco’s Fishermans Wharf: “The opening of crab season in November is a festive occasion. It is the day when the cauldrons along Fisherman’s Wharf are lighted, ready to receive the boxes piled high with Dungeness crab hoisted from the decks of the first boats that come chuffing back into port. It is a time for gourmet feasting that will last through many months to follow. to hold all the crab), melt the butter and olive oil over medium heat. Add shallot and garlic and sauté until soft, but not browned. Add Sambal, parsley and cilantro, reserving a small handful for garnishing. Add crab, and toss to coat with the sauce. Move skillet to the oven, and roast for 20 minutes, until heated through. Put crab on a platter, and add the juice of 1–2 limes to the remaining sauce in skillet. Whisk to combine and pour over crab. Finish with remaining herbs and lime wedges. Continue reading the History of Dungeness crab at San Francisco’s Fishermans Wharf.